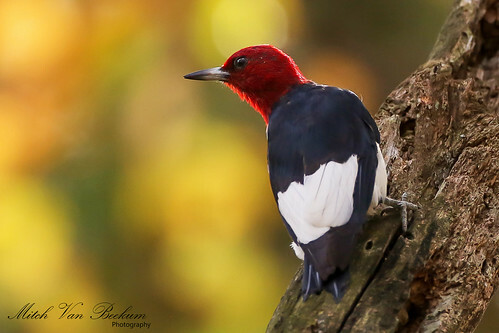 A Red-headed Woodpecker continues today at Bee Meadow Park, Whippany, NJ (Mitch Van Beekum). This represents yet another new location for this species in the mocosocoBirds region this autumn. A first-of-season Dark-eyed Junco visited my feeder today in Long Valley. 8 Eastern Meadowlarks and 9 American Pipits were at Duke Farms, Hillsborough Twp. this morning (Jeff Ellerbusch). A Virginia Rail was flushed at the Lincoln Park Gravel Pits late this afternoon. There are now 3 Ring-necked Ducks on the large pond. Water Chestnut (Trapa natans), which has taken over half of the large pond, is spent for the season and slowly becoming submerged. The following statement is an observation only: the ducks and geese actually seem to like it. There was a large group of Canada Geese along with the Ring-necked Ducks a group of Wood Ducks, Green-winged teal, 1 Blue -winged Teal and 5 Pied-billed Grebes feeding in the chestnut debris. Present throughout The Pits were 100+ Wood Ducks, 14 Green-winged teal, 1 Blue-winged teal, 3 Ring-necked Ducks, 6 Pied-billed Grebes, the aforementioned Virginia Rail, 4 Tree Swallows, 30+ Palm Warblers, 40+ Yellow-rumped Warblers, and Song, Swamp (lots) and White-throated Sparrows. in Parsippany were NOT seen today (Julie Buechner).